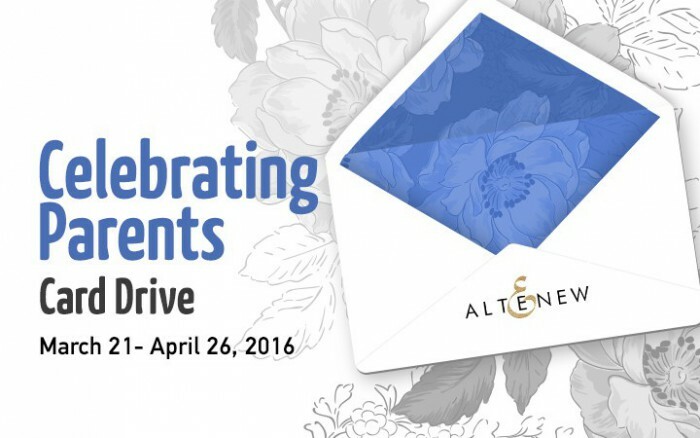 Hello all and thank you for joining us today for the Celebrating Parents Card Drive and Blog Hop from Altenew (more on that below). 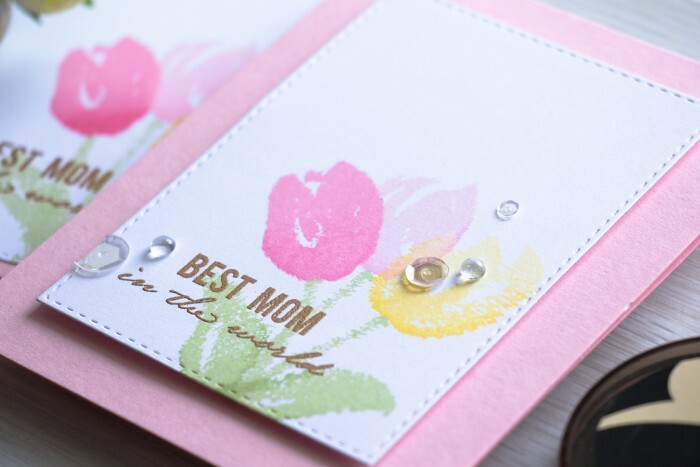 I’m sharing a Mother’s Day Card with faux painted tulips in this blog post along with a video tutorial. I am using a unique Brush Art Floral stamp set that creates a faux painted look. There are quite a few floral and leaf images in there all designed with that faux painted look in mind. All you need to do is ink it up and stamp. Simple as that. I chose to use tulips for my cards today as these are beautiful Spring flowers. To make them a bit more unique I used several colors of ink to stamp each and created highlights and shadows on my stamped images. If you look closely you can see that flowers are darker at the base and lighter at the tips of the petals. All of the colors I used are listed at the end of this post. 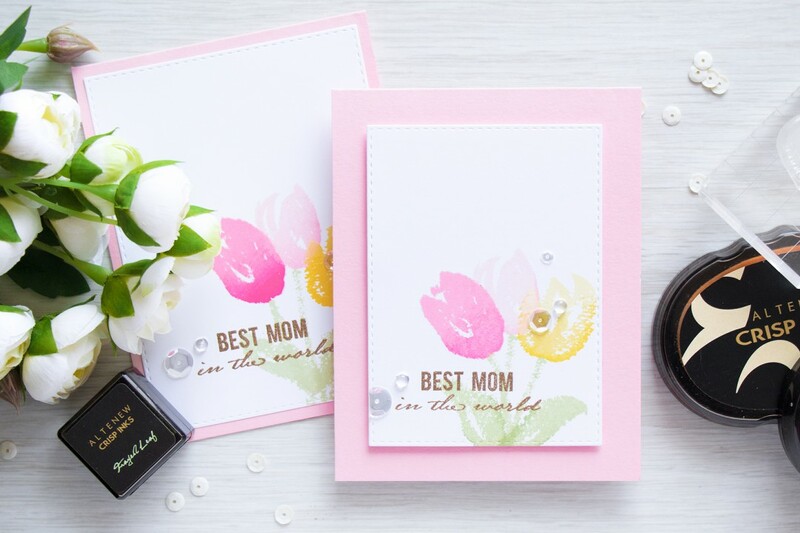 For my sentiment I used Wild Hibiscus stamp set and heat embossed Best Mom in the World using Brass embossing powder from Hero Arts. My stamped and heat embossed panels were trimmed using Simon Says Stamp Stitched Rectangle dies and foam mounted onto light pink A2 top folding card bases. 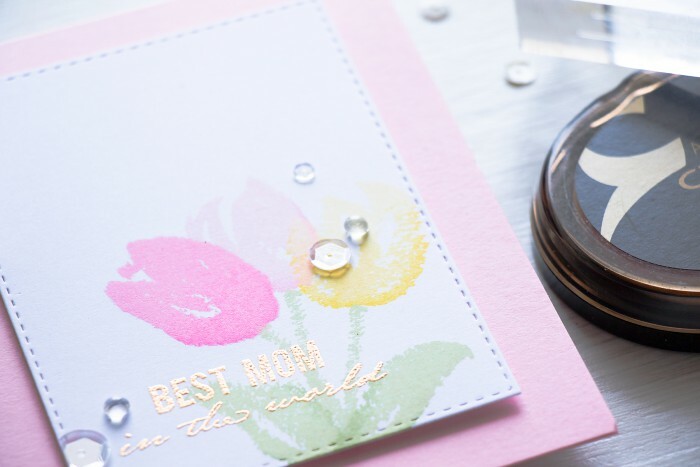 I embellished my cards using clear sequins and droplets from Pretty Pink Posh. 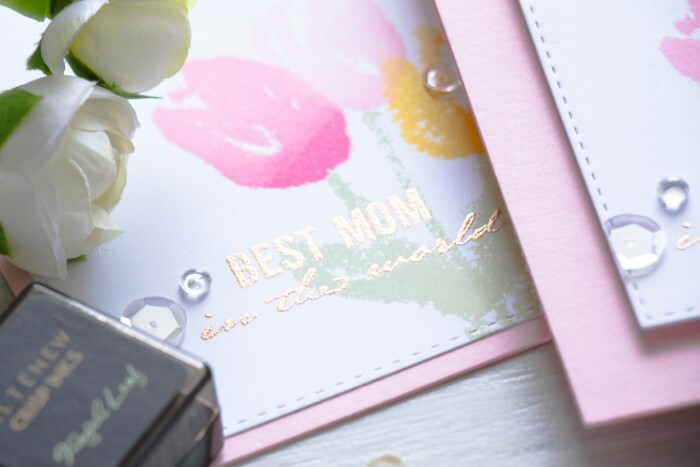 Altenew is releasing a special collection of 3 new stamp sets (Best Dad, Best Mom and Penned Rose) which would be perfect for creating Mother’s Day and Father’s Day cards. 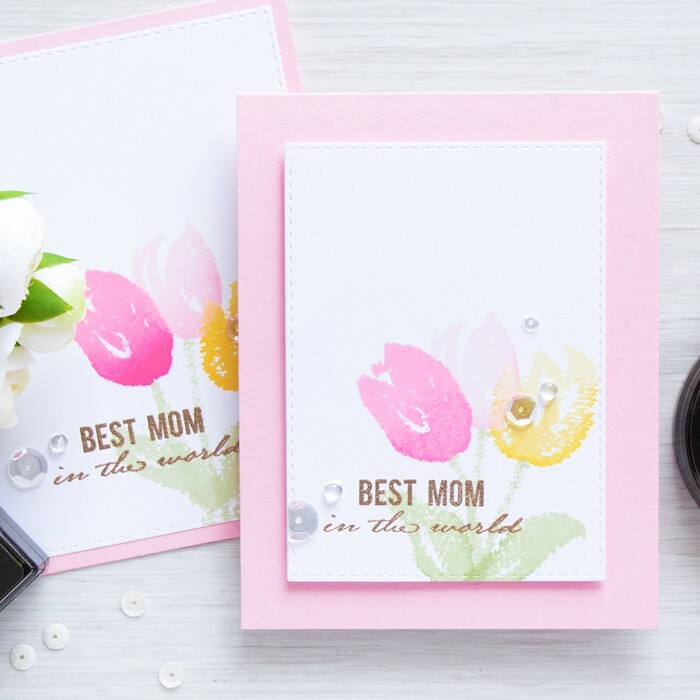 These stamp sets were designed especially for the Celebrating Parents Card Drive and 20% of the profits earned by Father’s Day will be donated. Our goal is to send cards for the elderly that live in nursing homes or shelters to let them know they’re not forgotten. Feel free to check out the Celebrating Parents Card Drive and join this great cause by sending in cards. Find more details about the Celebrating Parents Card Drive HERE. There are two $50 gift certificates up for grabs. Winners will be picked randomly from the comments left on the Altenew blog by Thursday April 8th, and we’ll announce two winners on Sunday, April 10. I also have one $30 gift certificate to give away to one lucky blog reader. Please comment below and let me know for your chance to win. I’ll pick the winner, email and post winner’s name in this blog post on Sunday, April 10. The winner is Carrie R. congratulations! I’ve e-mailed you and folks at Altenew so that you can claim your prize. Thank you all! Hop along with us to find more creative inspiration! If you arrived from my talented friend Svitlana Shayevich the next stop on the hop is amazing Agnieszka Malyszek. If you get lost or encounter a broken link, please start at the beginning on Altenew Blog. wow… your cards are always so amazing!!! these are just beautiful! Yana, those tulips with the embossed sentiment are gorgeous! Thanks for sharing how you did this and for supporting our beloved seniors with this card drive. Gorgeous!!! So elegant!! I also love the video!! so beautiful! thanks for the video too! Softly colored beautiful flowers as usual Yana! You never disappoint!! Wow…so beautiful!! What an amazing card! Thank you for the inspiration and the video tutorial. Thank you so much for sharing! Love the color gradation! Your cards are always so beautiful! Love the colors you used on this beautiful card. Thanks for the video, too! Really lovely! I really like how the colors fade a bit on the tulips! Oh, this is so lovely. I like the soft look of this and the sweet colors. Gorgeous card! I love how soft the images and colors are! Such beautiful cards Yana. Thanks for all your helpful hints. The Altnew stamps look amazing! Love the soft colors of these tulips! Beautiful! I always love your cards and your videos. Thank you. This is pretty.